Lamp can be wall mounted (3 panels) or free hanging (4 panels). 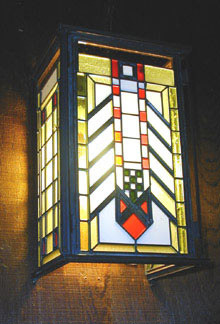 Patterns shown with original came but lamp may be foiled. Measures 8 3/8" wide x 13 3/4" high x 6 7/8" deep.